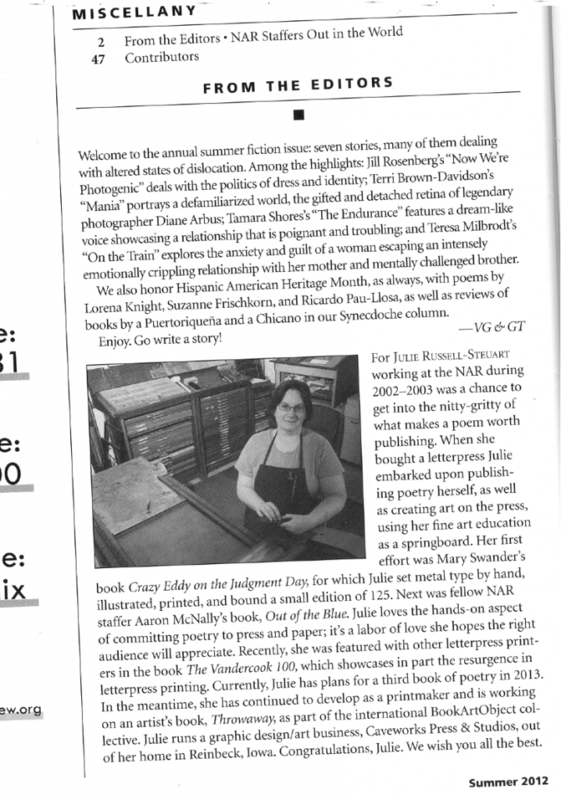 Caveworks Press featured in North American Review's "NAR Staffers Out in the World"
—amid the concentration and depth of a single class that fit with my work schedule, amid the mornings spent, bent to my drawing table, crafting language, I became a reader at the North American Review. It was an experience that I will never forget. We readers lounged in the office absorbing earnest poetry submissions, noting our reactions, inner ears attuned to rhythms in word patterns, sound sense, the overall “Mono no aware”, a Japanese term that refers to the essential meaning of an artwork, beyond the superficial, housed in the moment of discovery. I was looking for such moments in the poetry I was reading. At poetry review meetings, armed with our copies of poems that had been culled from submissions, a stack at least an inch thick, we discussed which poems we liked and why. We got to know each other’s likes and dislikes. I became an unsung champion for poets who had written a poem I thought was outstanding and should be published. I am proud to say, because of me, that poem was published, though the poet will never know what I had done. My duty was to support excellence. Now as a publisher of small press poetry titles, the same fire burns. It is my pleasure to get to know the poets I work with, to support them more fully by designing books myself, printing them, arranging readings, and being so closely involved. I am working on another poet’s book plan presently, and I hope to be posting some details in the near future, as well as a Kickstarter campaign. Congratulations Julie! What a wonderful article about you and your amazing talents!